“Make this the year YOU discover a new destination,” begins a video released yesterday by British street artist Banksy. Our suggested new and exciting vacation destination? The war-torn Gaza strip. In a two-minute video, Banksy satirizes promotional travel videos, pairing typical advertising rhetoric with the harsh realities of life in Gaza. 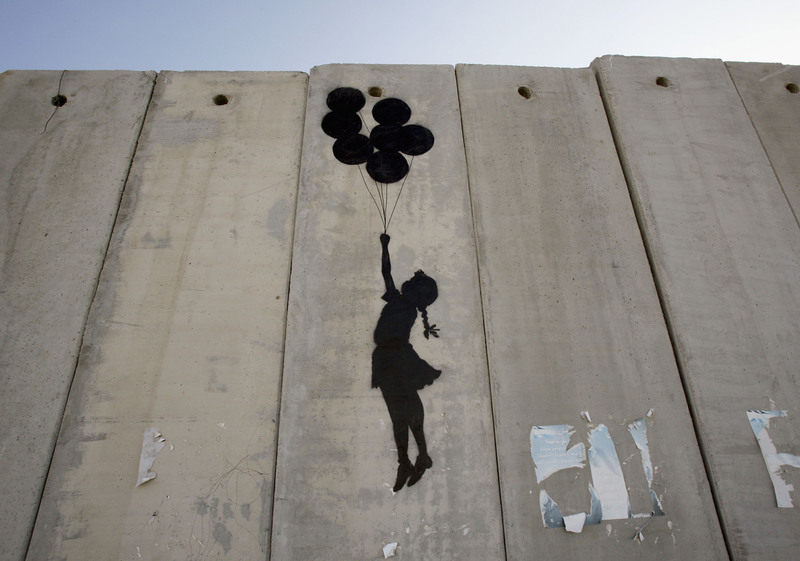 The video boasts that the region is “Well away from the tourist track (Access via a network of illegal tunnels).” The faux documentary continues, stating that “[t]he locals like it so much they never leave” before panning to a group of soldiers and adding, “(Because they’re not allowed to).” This is not the first time that Banksy, whose identity has never been confirmed, has created art related to the Israel-Palestine conflict; He made headlines in 2005 when he visited the West Bank and painted a number of images on the barrier (including the balloon stencil, pictured above). A local man came up and said 'Please - what does this mean?' I explained I wanted to highlight the destruction in Gaza by posting photos on my website – but on the internet people only look at pictures of kittens. See more photos on Banksy's website.